Having a dog can be like having a kid sometimes – they require a lot of attention, care, and love. If you travel in your car a lot or just take your dog places on occasion, there are some must-have accessories to keep in your car if you have a dog. 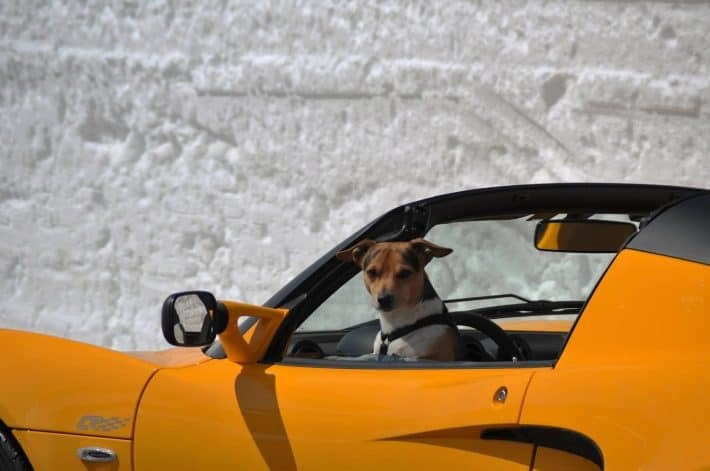 It can help you keep your car clean, be prepared for emergencies, and just make a car trip more enjoyable for your dog. Just like you may have accessories in your car for yourself or your kids, you should have accessories in your car for your dog. From entertainment on a long trip to something to have when you’re at their favorite park, these are some great items to have in your car when you have a dog. There are many places online and in-stores you can find backseat covers for your pet. They fit standard cars, trucks, and SUVs. They are waterproof, and protect from dirt, spills, scratches, hair, fur, and other accidents that your pet might create. Sounds a little over the top, but you never know when it could come in handy. This bubble machine has non-toxic, bacon scented solution that blows the bubbles for your dog to chase. If you’re on a long road-trip and want to get them active at a pit stop, or maybe waste some of their energy, this toy is great to pop out and have them running around. Sometimes a sling like a satchel and other times like a papoose, a pet sling is a must for those with smaller dogs or puppies. If you’re going somewhere in a hurry and will need your hands, it’s an easy way to pamper your pet and giving you the freedom you need. This makes it easy to store your accessories for your dog while making them accessible. This is great for long car rides or when you need to give the pet to a sitter. It comes with a 1-liter BPA free water bottle, two collapsible travel bowls, and a 10-cup storage bag for food. If you’re a camper and enjoy camping, you won’t need to worry about tears in your tent with a tent for your dog. It gives them their own space to relax, without taking up your side of the tent. If you’re taking a road trip with your pet, you should have their medical record folder on hand, and what better way to have it then storing it in your car. In case of an emergency, make sure you have their records with previous medical surgeries, shots, medicines, or other conditions they could have. Sometimes grass may not be available if you’re taking them shopping or traveling. Especially if you have older dogs and puppies, this could come in handy for the pets that can’t control themselves. It’s lightweight, small, and folds up like a suitcase. It has grated holes to let urine pass through, but a reservoir that keeps it from spilling out. It’s also easy to empty and clean. If you’re taking your dog to the beach, the muddy park, or you’re camping with them, having waterless shampoo can make it easy to keep them and your car clean. All you need is a brush, cloth, and the foaming shampoo. This should be a must no matter what! Having a dog, they might need to do their business at some point, and you should have a waste bag on handy no matter where you go with them. We love our pets, but we can’t lie – sometimes their dog smell can be kind of smelly and absorbent. That’s why having an odor eliminator scent can come in handy. Sometimes we realize too late that our pet needs a bath and the smell lingers in your car. Whether they’re with you or not, give the car a squirt. More suitable for smaller dogs, it makes for convenient transport of your pets. The see-through mesh material lets your dog see what’s going on around them, and it also is equipped with a tote-style handle. Not only will it keep your dog from roaming around unnecessarily in the back seat, but it also creates for safe travel. It stays in place while giving your dog the option to look out the window. Most of them are also washable and come with a safety leash to keep them in the booster. For pet-friendly places that require a lot of walking or your dog can often get distracted, a pet stroller is not only perfect for pampering them, but also convenient for making your life just a bit easier when traveling with them. If you don’t want to invest in an entire kit, you can get just a single bowl. It should be a must to have this item because dogs can get easily dehydrated just like humans. You can carry the water dish wherever with you since it is collapsible, waterproof, and lightweight. You never know when your dog can get injured, so having a first aid kit is just as important as having one for yourself and kids. You never know what the weather can be like or what sort of environment you’ll be going into when you take your pet somewhere. If you live somewhere where it snows, having booties is important because the salt used on roads and sidewalks can damage the pads on their paws. It can protect them from broken glass, sharp rocks, and thistles. If you have an older, larger dog, it may be important to get them a pet ramp. Getting into the trunk or the car can get difficult for them, and a ramp will be able to fold up nice and easy. If your car isn’t already equipped with a backup camera, you might want to get one that comes on a license plate or attaches to your trunk. With a dog running around, you never want an accident to happen when they’re running around. For longer trips or when you put down the backseats of your car, a cargo liner can cover the folded seats and hard plastic to make the backseat more comfortable for your pet. Just like the backseat cover, the front seat will help protect your passenger seat from dirt, spills, and other accidents, as well as from shedding. LoanMart Cares About Your Pups Safety! LoanMart wants to make sure you’re prepared for your pup in an emergency, and that they are safe in your car. In case of emergencies, LoanMart can help their customers pay for their pets’ surgeries, medicines, and other things you may need with auto title loans. By using the title of your vehicle as collateral for a loan, you could qualify up to $30,000 based on the equity value of your car and your source of income1. Call us today to get started or if you have any questions at 1-855-422-7412. Previous post: Can I Give My Title Loan Money Back if I Have Second Thoughts?